Comments: Pleasant Morgan and Sarah 'Sallie' (Clark) Burgess stand on the steps of Locust Grove, the Burgess family plantation on the Hardware River at Temperance Bridge between Scottsville and Fork Union in Fluvanna County, Virginia. The house, surrounded by enormous boxwoods and tall trees, no longer stands, but the Burgess family cemetery still remains on the old plantation land. According to the Clark-Burgess family Bible (printed in 1856) and U.S. census records, Pleasant Burgess was born in 1833 and died August 9, 1906. Pleasant was the son of Daniel Morgan Burgess (Daniel was born ca. 1790, the son of John Burgess and Elizabeth Bond) and Julia A. Lindsay (1804-1884, the daughter of Opie and Jemina (Bates) Lindsay). Pleasant's mother, Julia, is shown in this photo at right; she is buried in the Burgess family cemetery at Locust Grove. Sarah Clark, the eventual wife of Pleasant Burgess, was born May 22, 1838; she was the daughter of David H. Clark (born November 27, 1804) and his wife, Amanda D. Maupin (born June 1809). Sallie died June 18, 1913, and is buried at the Burgess family cemetery at Locust Grove. (1) Hattie Virginia Burgess, born March 26, 1865; died December 1, 1868. (2) Florence Lindsay Burgess, born April 11, 1866; died September 16, 1894. In the photo at right, taken circa 1878, Florence is shown with her brother, William 'Willie' Edward. Florence married John Lee Pitts on September 17, 1884, at the Burgess family home in Locust Grove, and they were the parents of five children: David Gordon (1885-1901); Arthur Marion (1887-1932); Clara Lee (1889-1951); John Lee, Jr. (1894-1984); and Floyd Lindsay Pitts (1894-1962). Florence died on September 16, 1894, after giving birth to twin sons. She is buried in the Burgess family cemetery at Locust Grove. (3) Charles Russell Burgess born November 29, 1867; died November 11 (or 29), 1868. (4) Helen Amanda Burgess was born August 14, 1869, and died March 30, 1962; Helen is buried in the Pitts family section of the Baptist Cemetery, Scottsville, VA. Helen married John Lee Pitts as his second wife on October 19, 1896, and was the sister of John's first wife, Florence. She was an active member of the Scottsville Methodist Church. Helen and John Lee Pitts were the parents of three children: Helen Virginia (1898-1959), Katherine (1907-1992), and Dorothy May Pitts (1909-1993). (5) William 'Willie' Edward Burgess was born on July 10, 1871, at Locust Grove, the Burgess plantation on the Hardware River between Fork Union and Scottsville. He possessed a mischievous sense of humor, wrote beautiful poetry, and became Scottsville's photographic historian for the years 1890-1935. 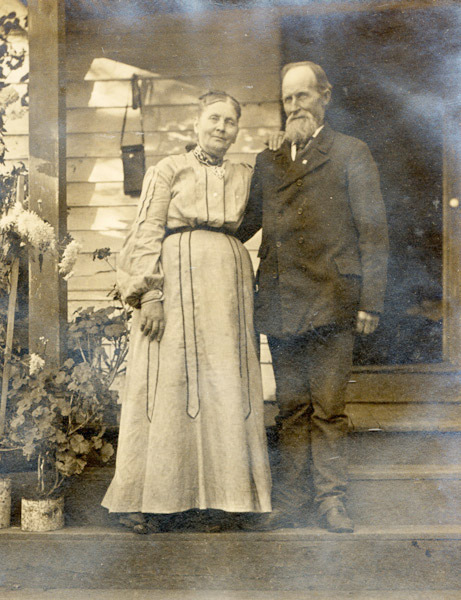 Willie married Ellen Gentry Cornett on October 4, 1899, in Elk Creek, Grayson County, Virginia. Gentry (1871-1912) was the daughter of Judge George W. and Sarah Jean Gentry Cornett of Elk Creek. Willie and Gentry Burgess lived at Idylwood near Scottsville and were the parents of three children: Laurence Edward (1901), George Gentry (1903-1913), and William Harold (1907-1998). After his wife died unexpectedly in 1912, Willie raised his three sons at Idylwood and never remarried. He continued his active photographic life, and many of his photographs of Virginia scenes were printed and sold as postcards. When Willie Burgess died on July 2, 1935, he had amassed an extensive collection consisting of 20,000 of his photographs and 485,000 postcards. In 2001, Burgess postcards continue to be sought after by postal collectors. Willie Burgess is buried beside his wife, Gentry, at Locust Grove in Fluvanna County, Virginia. (6) Laura Adelaide Burgess was born on August 17, 1873, at Locust Grove. Laura married Frank Britt Colley (1867-1908) on April 26, 1899. Frank and Laura Colley were the parents of one child, Helen Kathleen Colley (1905). Laura and her daughter were frequent subjects of her brother's camera, and this portrait section contains several photos of these two ladies as William Burgess often gave them a family portrait as a Christmas present. After Frank Colley's death, Laura Burgess Colley married secondly a Mr. Babb. (7) Cornelia Clark Burgess was born on November 4, 1876, and died on April 24, 1961. Cornelia married Walter S. Dorrier of Scottsville. Aunt 'Neal' was an artist who painted with oils before she married; in later years, she also painted with watercolors. Cornelia and Walter lived at Locust Grove until they built their home, Nealand, in 1913. Nealand is located near Scottsville and has been in the Dorrier family ever since The Dorriers had one son, Edward Lindsay Dorrier, who was born in 1906. Edward Dorrier married Hazel Cleveinger, and they were the parents of one daughter, Irene Dorrier. (8) Garnett Burgess was born on September 7, 1881, and was the youngest child of Pleasant and Sallie Burgess. 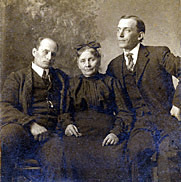 Garnett is shown in this Idylwood photo with his brother, William, at left, and his mother, Sallie, at center. Garnett married Mary Elizabeth Scott on July 7, 1912, and they were the parents of three children: Elizabeth Garnett (1916), James Garnett (1919), and Charles Burgess (1921). Garnett Burgess died on June 11, 1945. The above photo of Willie Burgess is part of the Doug Burgess collection. Doug resides in Palmyra, Virginia and is the great grandson of Willie and Ellen Gentry (Cornett) Burgess. The other Burgess family photos are part of the Kathleen McNamara collection. Kathleen resides in Scottsville and is the granddaughter of John Lee and Helen Amanda (Burgess) Pitts. A) Clark-Burgess Family Bible Record, 1804-1962, Library of Virginia, Richmond, VA. Call number: 26326; http://image.lva.virginia.gov/Bible/26326/index.html Bible Record Image. Bible printed in 1856. B) Pitts Family Bible Record, 1852-1959, Library of Virginia, Richmond, VA. Call number: 33442; http://image.lva.virginia.gov/Bible/33442/index.html Bible Record Image. Bible printed in 1874. D) Jan. 3, 1846 Letter, from Daniel M. Burgess (b. ca. 1790) of Fluvanna Co., VA; Library of Virginia, Richmond, VA. Call No. 37249. Daniel Burgess was the son of John Burgess (1747-1835) and Elizabeth Bond; he married Julia A. Lindsey in Fluvanna Co., VA, on 15 Dec. 1831.